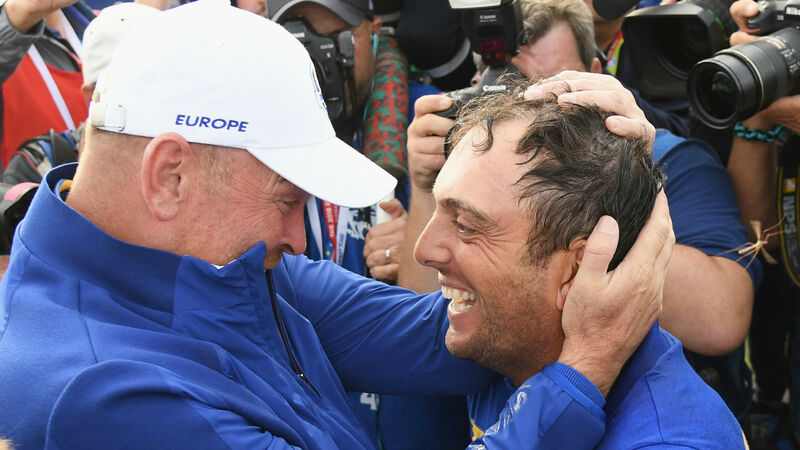 SAINT-QUENTIN-EN-YVELINES, France – Ryder Cup hero Francesco Molinari underlined the special place the event holds in his heart after sealing the winning point at Le Golf National. The Italian wrapped up a 5-0 record with a 4 and 2 triumph over Phil Mickelson as Team Europe regained the title in emphatic fashion. Molinari won this year’s Open to claim his first major, but said Sunday’s success was far more important. Asked what it meant to him, Molinari said: “So much, so much more than majors, more than anything. “You know, it’s hard not to get emotional when you think about the other players, the vice captains, Thomas [Bjorn], the wives. Molinari teamed up with rookie Tommy Fleetwood for four victories, the duo earning the tag “Moliwood” after lighting up the competition. “I had an amazing partner in Tommy,” added Molinari. “I never felt like I had a rookie playing alongside me. It’s been amazing. “It was just hard to get the energy [on Sunday]. It’s been a long week, playing five matches, but I stepped it up when I had to and that [decisive] putt on 14 was great. Just amazing.